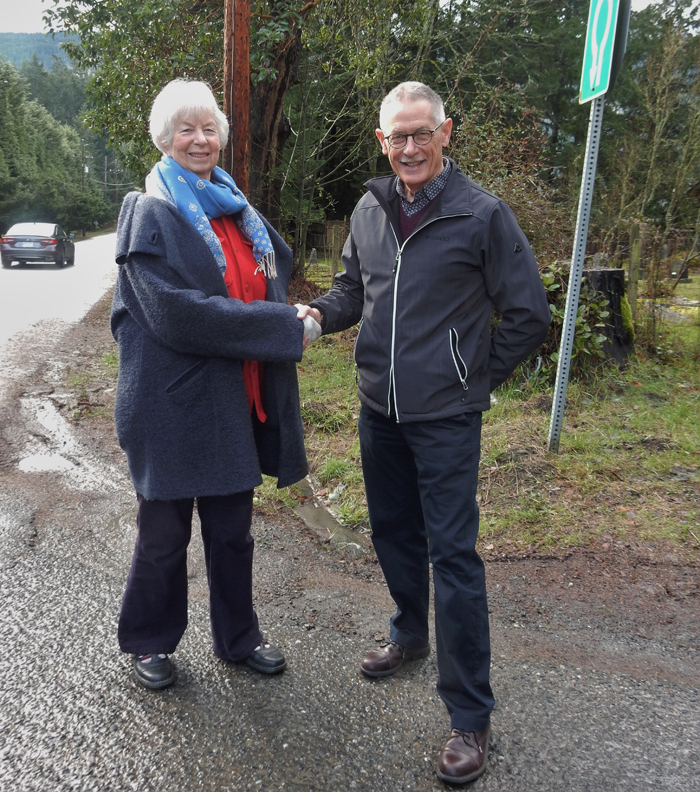 Jean Gelwicks, chair of Partners Creating Pathways, and Gordon Chutter, chair of the Salt Spring Island Foundation's grants advisory committee, shake hands at the corner of Lower Ganges and Baker roads. A new section of pathway along Lower Ganges Road will be built between Baker and Booth Canal roads, thanks to the foundation giving PCP a $100,000 Shaw family grant for the project. A local organization has received funding to add to the pathway connecting Ganges and Central. Partners Creating Pathways is the 2018 recipient of the Shaw Family Community Grant. The grant is one of five $100,000 grants awarded by the Salt Spring Island Foundation from the Shaw bequest over a five-year period. This year’s grant will help construct a stretch of path along Lower Ganges Road from Booth Canal to Baker roads. It is part of Partners Creating Pathways’ plan to connect Ganges and Central by a multi-use cycling and walking path by 2020. The plan is to eventually extend the current pathway from Ganges village to Portlock Park. The pathway will allow people to travel along Lower Ganges Road safely and be a part of the proposed CRD Regional Trail route. Planning is currently underway for the pathway, and construction will hopefully begin this spring, according to a Salt Spring Island Foundation press release. For more on this story, see the Feb. 7, 2018 issue of the Gulf Islands Driftwood newspaper, or subscribe online.